The 2013 Pennsylvania Farm Show just completed a week-long celebration of agriculture in Pennsylvania with exhibits, lots of food, animal exhibits and judging (over 6,000 animals), special events and then there is always the butter sculpture. 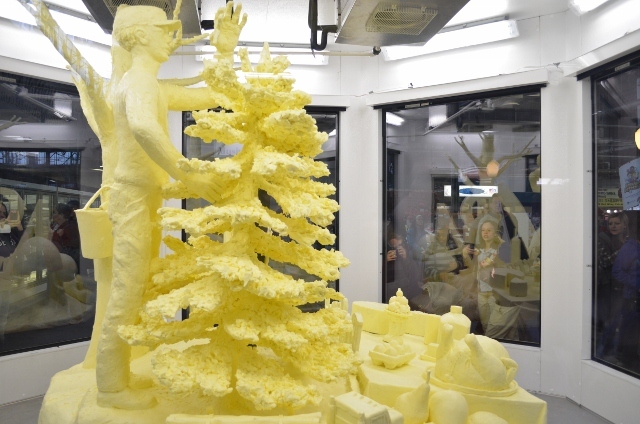 This year’s butter sculpture focused on Pennsylvania’s products. The PA Farm Show is the largest indoor agricultural event in America with over 400,000 visitors each year. The show includes 10,000 competitive exhibits and 270 commercial exhibitors. A highlight of the Farm Show is that each state agricultural group is selling its products in the food court such as the Pork Producers, Potato Growers, Fruit Growers, Livestock Association, Mushroom Growers, Maple Syrup Producers and many more. I enjoyed one of the 100,000 milkshakes sold by the Pennsylvania Dairymen’s Association. The Farm Show is a wonderful opportunity to enjoy and support the state’s large agricultural community. whoa!! That is amazing! Wish I could drop in to see it all.